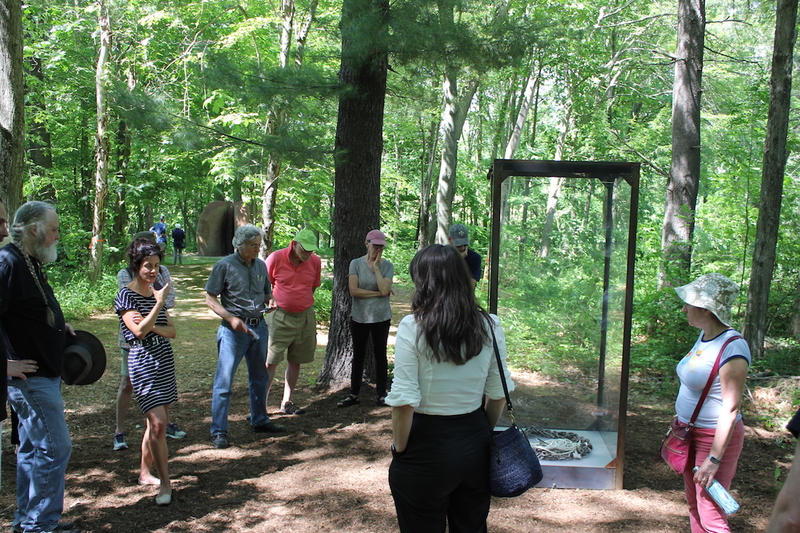 The Art Omi Sculpture & Architecture Park is open year round to the public during daylight hours. If seeking to experience all of the work, one will traverse grassy fields, forested paths, hills, and footbridges. There are no paved walking paths, and occasionally the trails become muddy and sometimes even impassable. Therefore, we recommend that visitors come prepared with sturdy footwear and weather-appropriate attire to best enjoy their experience. In the winter, groomed cross country ski trails are free and open to the public. Visitors are encouraged to enjoy picnic facilities located throughout the park. Guided tours are available to groups of six or more with a reservation. 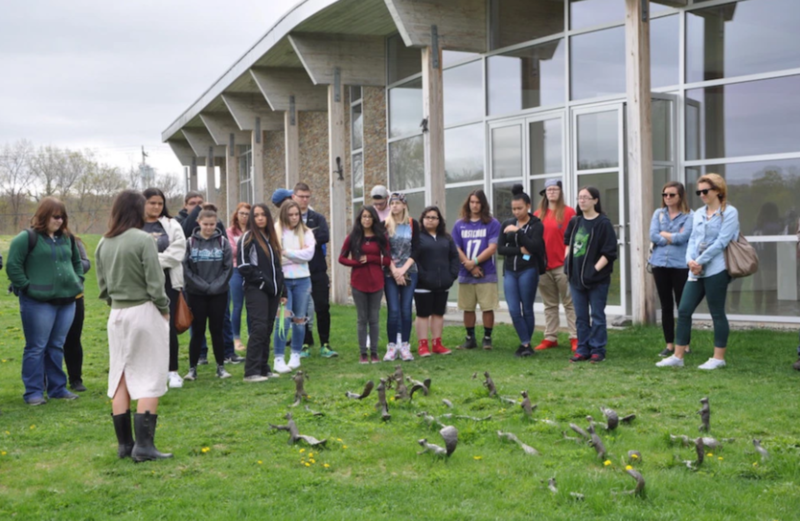 The Art Omi Sculpture & Architecture Park offers educational workshops and tours for school groups and other organizations as well as free public programs throughout the year. The Benenson Center is open daily year-round except Thanksgiving, Christmas Eve, Christmas, and New Year's Day. Restrooms are located inside the Benenson Center, as well as a café serving snacks and beverages on the weekdays, and light lunch fare on the weekends. The Benenson Center is also home to a gallery and lobby exhibition space, as well as a small library for visitors to enjoy. Dog Policy: Art Omi requires that all dogs be kept on leash between 9:30 a.m. to 4 p.m. Dogs must be kept on leash at all times in the Benenson Center. Accessibility: The Benenson Center, Newmark Gallery, and restrooms are accessible to wheelchairs. During the high season (May - October), weekend golf cart tours are available for those with mobility impairments. Inquire about scheduling a tour via golf cart by calling (518) 392-4747. For individuals requiring other accommodations, or who wish to tour the Sculpture & Architecture Park outside the high season, please call (518) 392-4747 to discuss possible arrangements. Borrow a Bike: Art Omi does offer use of artist customized fat bikes which can be used throughout the park. Use of the bikes is free on a first-come first-served basis. To borrow, visit the Benenson Center upon your arrival. Length of Visit: Plan at least one hour to visit sculptures in all areas of the park. The path system is circular, so one can go in either direction. There are many sculptures tucked away in the woods to discover! Picnic Areas: Picnic tables and seating areas are located throughout the park for your use. Tours: Guided tours are available with prior arrangements. Tours can be tailored to an age group, theme, or event. Contact desk@artomi.org to make arrangements, or learn about upcoming tours you can join. Art Omi hosts events throughout the year, most of which are free and open to the public. Keep up to date with our events and more by joining our email list. Buy Art Omi merch here. Get directions to Art Omi. Open daily 11 a.m. - 4 p.m. Drinks and snacks weekdays. Lunch served on the weekends. Plan a self-guided tour with your group. Grab a map and head out into The Sculpture & Architecture Park where you can spend plenty of independent time viewing the sculptures, architectural works, discovering the park, and enjoying nature! To plan your visit, desk@artomi.org or call (518) 392-4747. Explore The Sculpture & Architecture Park with a knowledgeable guide, highlighting the latest exhibition and points of interest. Click here to learn more about scheduling a guided tour. School and group visits are available year-round and are designed to serve people of all ages, grade levels, and abilities. Click here to learn more about pricing and scheduling. 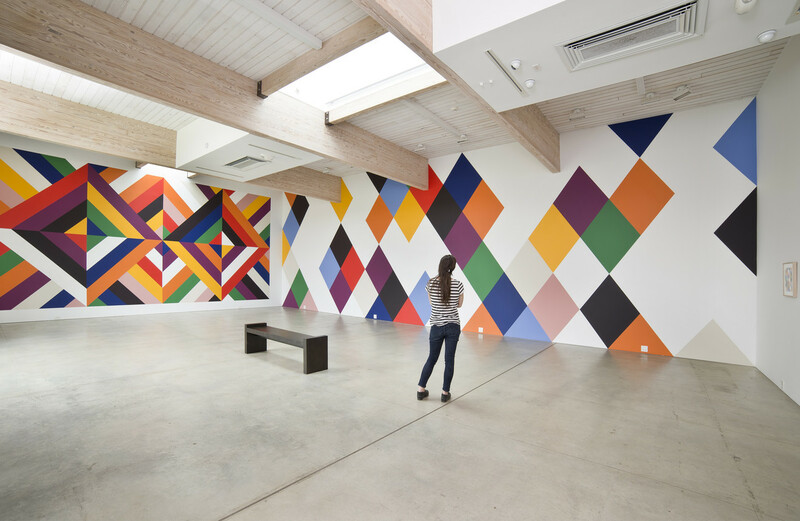 Art Omi is located two and a half hours north of New York City in the historic Hudson River Valley. The campus is located in Ghent NY and in close proximity to Albany and Hudson. Both cities offer convenient train access throughout the Hudson Valley Region. 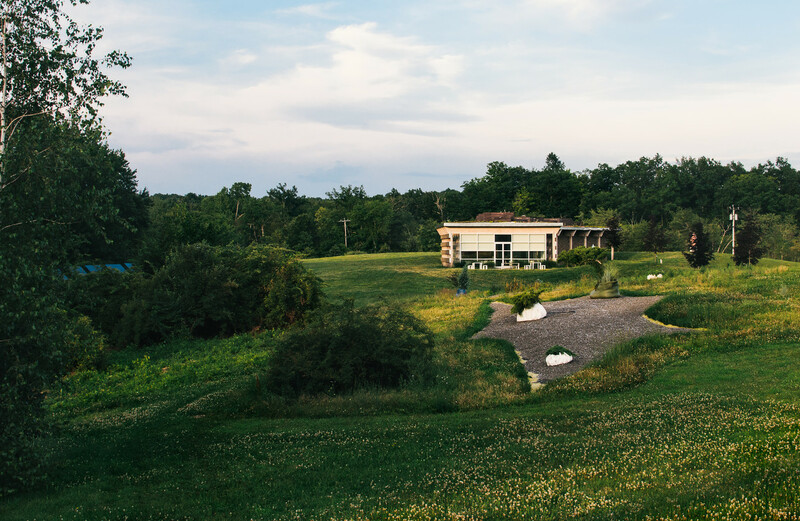 The facilities, situated on 300 acres of open land, include a large two-story barn with indoor studios; contemporary residence buildings designed with a vernacular reference to local barns, surrounded by abundant perennial beds, expansive lawns dotted with fruit trees, adjacent to The Sculpture & Architecture Park. A Federal Period farm house serves as a gathering center for our five residency programs, providing a full kitchen, television room and library; while the front porch overlooks rolling hills and the majestic outline of the Catskill Range. A swimming pool, bicycles, WiFi access and several state of the art computers are available on the premises. Art Omi's facilities are reserved for retreats, private rentals and our artists in residence.